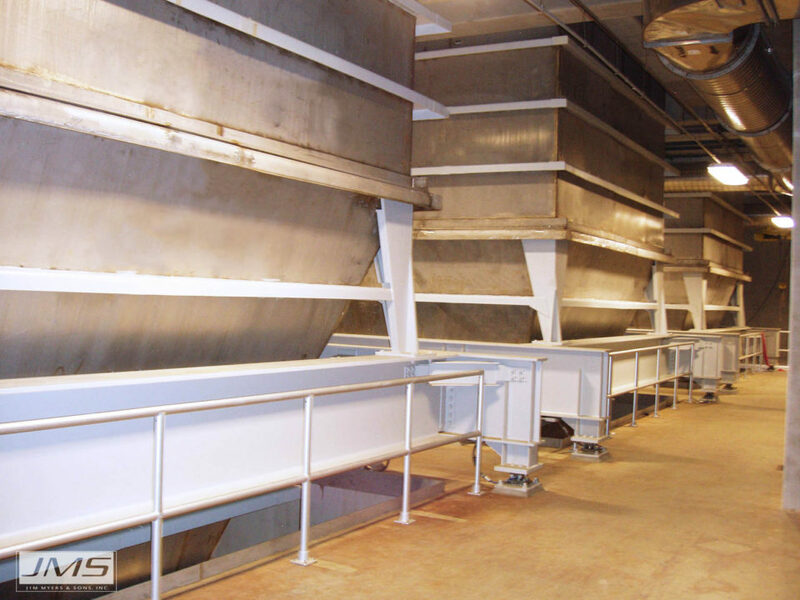 There are several applications for Material Handling Equipment in the Wastewater industry. Whether the application is conveyance or storage of dewatered biosolids, sludge, screenings or grit, it is important to consider such factors as volume, solids, density, of the substrate when choosing the right equipment for the job. Often times individual components are purchased to replace like components, or the same components can be put together in a complex Bio-HANDLING System. 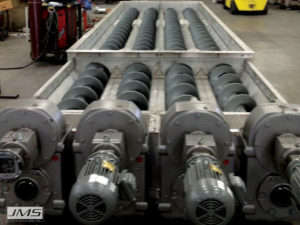 Conveyors move product from point A to point B and may drop product at multiple points by using gates or valves to divert, or the conveyor itself may be automated so the discharge is moving to multiple points. Once conveyor design load in cubic feet per hour (ft.3/hr.) and product density is known conveyors sizing and a budget price per foot can be offered. As a mid-level starting point of $1500/linear foot may be used for budgetary purposes (with caution) until design load is determined. 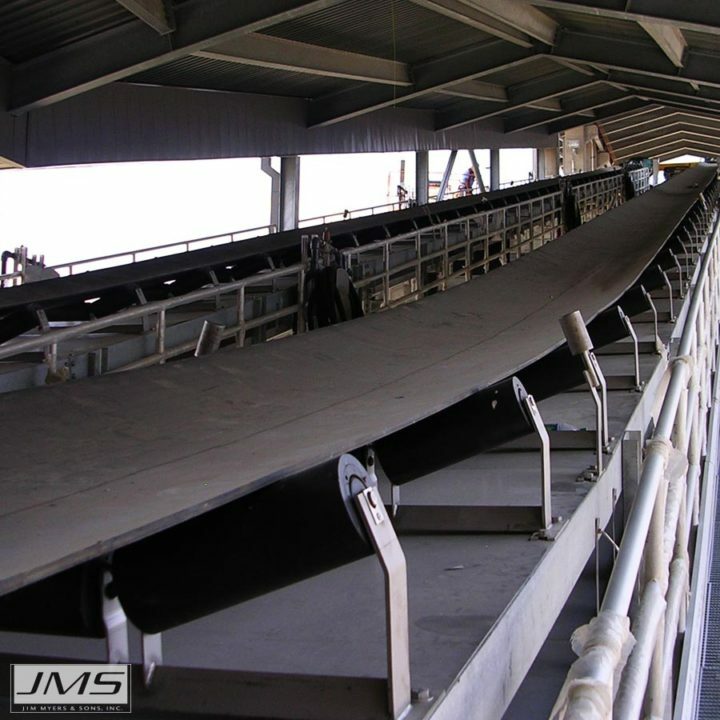 JMS has many conveyor types available including shafted screws, shaftless screws, troughing belts, sidewall belts, and more. 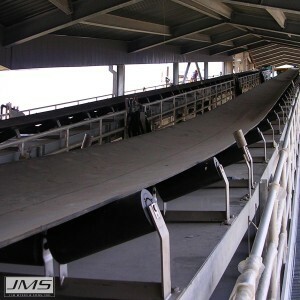 Slide Gates are often required for conveyors and hoppers. 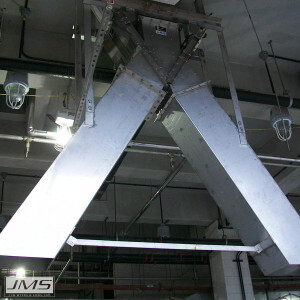 Slide gate budgets can run from $10,000 for a simple conveyor gate to $50,000 or more for large hopper gates. Variables that affect costs are materials of construction, gate opening, overhead load, and actuator type. Valve gates are also utilized on conveyors and hoppers. Valve gate (or flap valves) are often part of a bifurcated chute to divert product. Valve gate budgets can run from $10,000 for a simple conveyor gate to $50,000 or more for large hopper gates. Variables that affect costs are materials of construction, gate opening, and actuator type. Silo storage may be shop welded or site bolted. 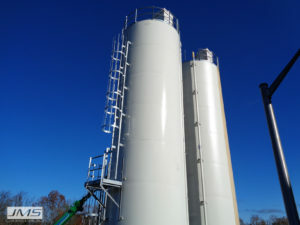 These are cylindrical tanks with conical bottoms used for free-flowing dried sludge with bin activators and air locks or live bottom screws for dewatered sludge. The cylindrical shape is the most economical per volume to manufacture but this shape is not as efficient for storage as a rectangular or square footprint. The budget capital cost of a cylindrical silo vessel can vary from $50,000 for a small bolted silo to over $1,000,000 depending on the size, and materials of construction. 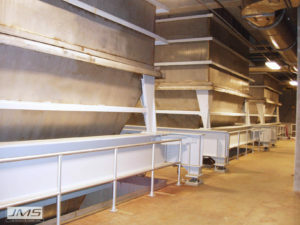 Rectangular or square hoppers are typically for dewatered sludge are the most volume efficient for their footprint, but will usually cost more per cubic yard of usable volume. They may be painted carbon steel, however the vessel is frequently stainless steel due to stainless steel prices, coating costs and handling. Large stainless steel hoppers often utilize carbon steel painted vertical columns due to the limited availability of heavy stainless I beams and their cost. Want to learn more about stainless steel construction vs painted carbon steel construction? Read this JMS Learning Center article to learn more. Budget capital cost of a hopper with live bottom, can vary from $50,000 to over $1,000,000 depending on the size, materials of construction, and complexity of the system as defined in the project scope. Live Bottom Screws are typically utilized in live bottom hoppers in arrangements of two or more. A single screw may be used in a small hopper with low percent dry solids content sludge. Multiple screws (live bottoms) are used to widen the hopper bottom discharge dimension to make best use of design shape for higher hopper volume and to break-up sludge bridging and rat-holing. Shafted or shaftless screws may be used. Shafted screws have a slightly higher up-front cost, but will not require the cost of the inaccessible liner replacement at a later date. Shafted screw lengths are limited to availability of pipe lengths which is typically 20’, but often up to 30’. Shaftless screws can be greater than 30’ but care has to be taken regarding spiral contraction or elongation and lifting which may require internal hold down bars. Designing with shaftless spirals spanning large gate openings in excess of 1.5 pitches should be avoided due to spiral flexibility. Budget prices for live bottom screws are included in the hopper budget as described above. 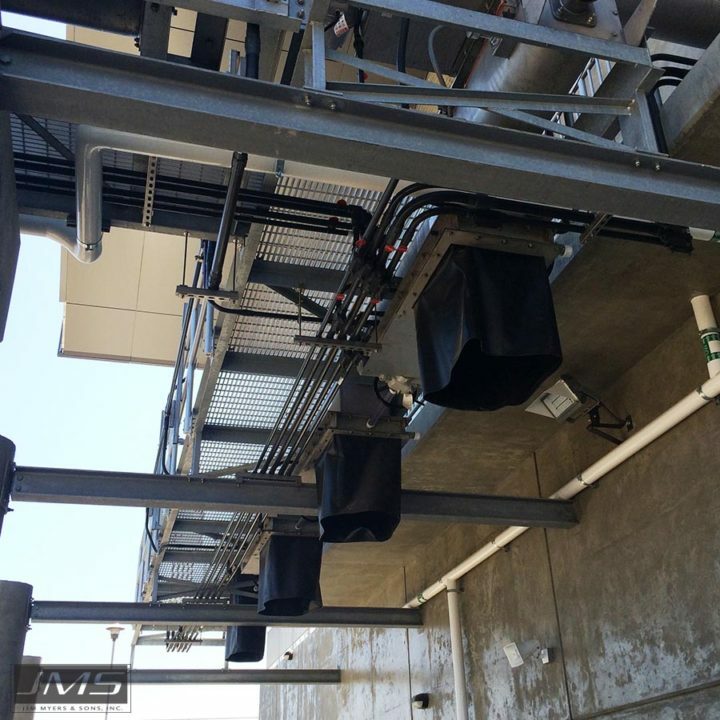 Structural steel, handrails, stairs, ladders, and platforms may be required in the multi-component bio-handling system. These components are generally manufactured from aluminum or stainless steel. Costs for additional structural components can vary widely depending on the needs of the project. Typically, adders are minimal and less than 10% of the cost of the system. Controls for the equipment may be supplied by an electrical system integrator or JMS. They may a simple or a sophisticated totally automatic system. A basic live-bottom hopper system can be controlled with a manual panel designed for operator control. An automated system may utilize load cells and ultra-sonic sensors for truck and hopper level monitor and control. Control budgets can run from $20,000 to over well $100,000 for a large automatic plc system. 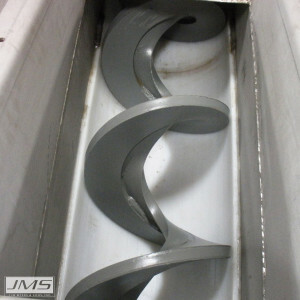 JMS has been manufacturing quality water and wastewater treatment equipment for over fifty years. We have pioneered many design and manufacturing enhancements that reduce that operational and maintenance needs of the equipment, and increase equipment longevity. JMS Equipment is designed for optimum performance and built to meet and exceed the 20-year life cycle reducing the total cost of ownership. Thanks for the interesting read about material handling equipment. I honestly didn’t know about slide gates or that their price could be affected by the materials of construction. I think it would be cool to visually see the different types of gates that are available or at least learn how they are each made. Thank you for your feedback we will add this to our list of topics and see if we can make a piece of content for it.